Rugby clubs London Scottish and Blackheath will contest a First World War Commemoration Match at Richmond Athletic Ground on Saturday 3 May. 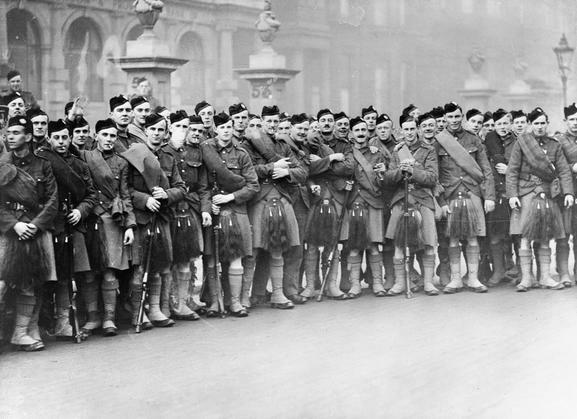 London Scottish, with its connection to the London Scottish Regiment (1/14th County of London Battalion), and Blackheath, through its proximity to Woolwich barracks, both had numerous members and players with military connections. Eighty-seven international players from the British Isles lost their lives during the First World War. Of these, 31 were Scots and some 25 of the 87 are on London Scottish’s or on Blackheath’s Roll of Honour. Four of them are on both. In all, London Scottish lost at least 100 members, half of them current players, while Blackheath had 60 killed. The 3 May match will comprise three thirds, involving academy players, seniors and veterans. It will be followed by events to commemorate the Centenary of the First World War, guest speakers and a lunch. The day begins at 11:30am with pipes and a wreath-laying followed by the rugby. Ground entry will be free, with donations going to the Poppy Factory Charity in Richmond and the youth teams from both clubs which are going to the Western Front in September. The local authorities in Laon, France are organising a weekend of events including commemorative matches on the 100th anniversary of the death of the first international player to be killed – Lieutenant RF Simson, a Scot who played for both London Scottish and Blackheath. This entry was posted in News, Soldiers of the Great War and tagged 3 May, Blackheath RFC, Centenary of the First World War, Lieutenant RF Simson, London Scottish RFC, memorials, news, rugby, Soldiers of the Great War, sport, UK News, WW1. Bookmark the permalink.